I went to a leadership camp with other exchange students in Mercersburg, Pennsylvania—near where I live. Before going to the camp, I had expected to learn how to communicate with different people, cultures, and perspectives and learn leadership skills as well as teamwork. Luckily, all my expectations came true. We took a test to determine our personality types and then divided into two groups that did an activity. We pretended to be survivors of a subarctic catastrophe and discussed which items we needed to keep. We did not succeed, because we did not know each other’s personality types and did not have sufficient knowledge about working in a group. Then, we learned about determining personality types and group skills, and it helped us to understand each other better and discuss issues more effectively. On the second day, we learned about leadership skills and leadership in a team. As teams worked together, we realized that we were using the skills we had learned. We had a group discussion about the most successful and energetic leaders to put our gained knowledge in action. 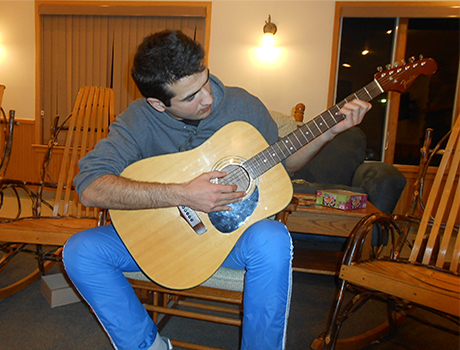 ...And then, I took a break to play my guitar!